The women indeed rocked! The Rock Hall 2011 Spring Benefit is The Rock and Roll Hall of Fame & Museum’s annual “It’s Only Rock and Roll” fundraiser for music programs in Cleveland public schools came a day after the Rock Museum on the lakefront debuted its new ‘Women Who Rock’ exhibit. Anyone who doubted that a mostly female concert lineup could electrify Public Hall were quickly made believers by the blood-curdling howl of Wanda Jackson, who opened the evening’s estrogen-fueled pyrotechnics, backed by her hot Nashville-based rockabilly band, the High Dollars. Ms. Jackson, a Class of 2009 Rock and Roll Hall of Fame Inductee, tore through a couple of new songs from her recent Jack White-produced CD, The Party Ain’t Over. 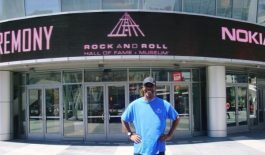 At Rock Hall Executive Director Terry Stewart’s personal request, Wanda closed herset by singing a sassy rendition of her mid-fifties hit, ‘Let’s Have A Party.’ Stewart could be seen doing a dodgy boo-ga-loo in the wings, stage left. This year the Spring Benefit decor reflected the Women Who Rock theme. There was an unmistakable “Nancy Sinatra/These Boots Are Made For Walkin'” late sixties look to the faux day-glo lounges set here and there on the main floor. To further embellish the Laugh-In/Goldie Hawn vibe, go-go-girls and go-go-guys shimmied behind micro-beaded curtains, in white-framed dance cages placed on stilts above the bars and lavish buffet tables. Back to the concert fundraiser: After Wanda Jackson left the stage to thunderous applause, Terry Stewart brought out the only two male lead singers to perform that night: former Tears for Fears front man, Curt Smith, and 60s soul stalwart, Chuck Jackson. Both gentlemen performed their respective three song sets admirably, with Smith’s “Everybody Wants To Change The World” and Jackson’s “Any Day Now” stirring spirited sing-a-longs from the VIP attendees on the main floor But, let’s face it: it was ladies night, in every way that counted. 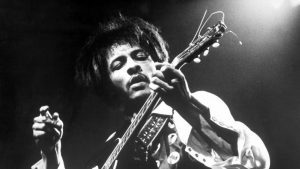 When Mavis Staples, another Rock and Roll Hall of Fame Member (with her father and siblings, The Staple Singers), strode next into the spotlight, even Cleveland Mayor Frank Jackson rushed to the front of the stage. Everyone in Public Hall- – -VIP attendees, balcony sitters and even wait staff- – -cheered with delight when, mid-song, Mavis invited Cyndi Lauper to join her onstage to help her out. 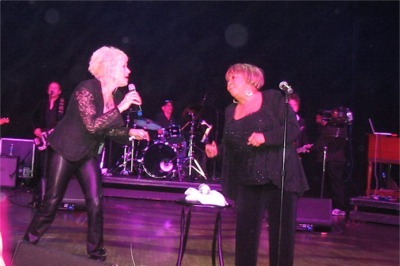 Mavis wrapped her set up with The Staple Singers classic “I’ll Take You There.” Lauper remained onstage and cajoled Darlene Love, a Class of 2011 Rock Hall Inductee, into singing background vocals. .The whole point of the Spring Benefit is to raise money for Cleveland public school children’s music programs. 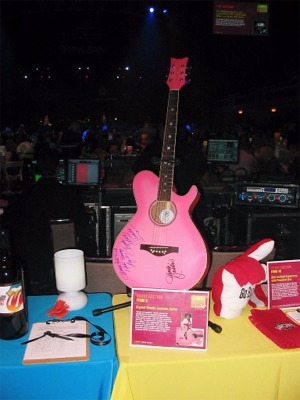 Stewart and company once again did an outstanding job, raising over $300,000 in addition to what had already been collected, with his mid-concert auction of items ranging from a Mercedes Benz to Wanda Jackson’s signed guitar to backstage VIP passes to U2s upcoming summer concert. The most powerful voice of the evening belonged to Darlene Love. She just killed with soaring renditions of her girl group classics “Da Doo Run Run” and “He’s A Rebel.” Regarding her now-imprisoned former Svengali, Phil Spector, Love quipped that he had gotten his-come-uppance. “He may have cheated me out of my money. But, here I am- – -and where is he?” “Jail! !”‘ the audience jeered. The evening closed with the manic Cyndi Lauper, vocal chords warmed up from all of her impromptu back up singing with Staples and Love, sprinting onstage to a menacing “She-Bop.” That night Lauper appropriated Peter Wolf’s shuga-buga lateral stage prancing and made it her own. She’s quite the dancer. In introducing her band, mostly ex-Stax studio session heavyweights, Cyndi confessed she had Pentecostal church-envy. In recounting her childhood church memories, she sounded as if she was raised Episcopalian. But, what she wanted to be was a member of a testifying holiness congregation. 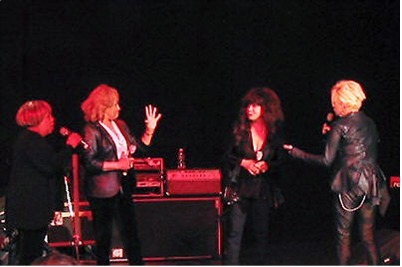 Lauper then brought out Mavis Staples, Darlene Love and surprise guest star (she wasn’t on the bill), Ronnie Spector- – -another Rock and Roll Hall of Fame Member (Class of 2007). After harmonizing on a gospel-drenched introduction to “Girls Just Want to Have Fun,” Cyndi then led the female Rock Hall of Famers on a towering, triumphant version of the song. Priceless. Women who rock? No doubt. Hopefully, in March of next year, when Cleveland once again hosts the actual Rock and Roll Hall of Fame Induction ceremonies, Cyndi will be back in Ohio’s largest North Coast city – – -as a member of the Class of 2012.